The prolonged aftereffects of the Great Recession have undermined the stature of political leaders in almost all the European nations surveyed. Their handling of the fallout from the economic downturn has weakened public trust in their competence. And the euro crisis has exposed intra-European divisions over German leadership and attitudes toward Germans in general, while reinforcing general stereotypes among Europeans about each other. In 2012, Angela Merkel was the most popular politician in Europe, except in Greece. In 2013, the German Chancellor’s handling of the economic downturn now gets mixed marks. Majorities in five of the eight nations surveyed – Merkel’s home country (74%), along with France (73%), Poland (72%), the Czech Republic (61%) and Britain (56%) – think she has done a good job dealing with the economic crisis. Yet her support has declined over the past year in five nations: by 24 points in Spain, 19 points in Italy, 10 points in Britain, and six points in both the Czech Republic and Germany. Notably, Merkel is more popular in east Germany (81%), the area of her birth, than in the west (73%). In the wake of the German government’s hardline stance in dealing with the financial troubles plaguing southern European countries, antipathy toward Merkel is particularly strong across the region. An overwhelming 88% of the Greeks say she is doing a bad job, including 64% who say a very bad job. A majority of the Spanish (57%) also judge Merkel harshly, as do 50% of the Italians. British Prime Minister David Cameron inspires far less confidence than Merkel in his economic management. A majority of the Poles (58%) say he is doing a good job, as do half (50%) the French, who express greater approval for the job he is doing than do the British people. 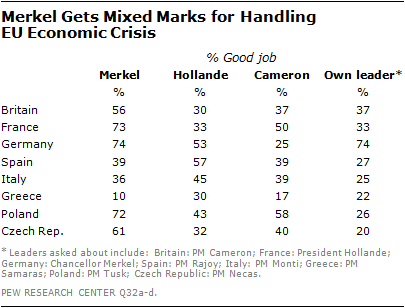 But beyond that, Cameron’s support is weak: Just 25% of the Germans and 17% of the Greeks give him a good grade. And in some countries, Cameron’s marks have declined since 2012: by 14 points in his own country and by 9 points in France. French President Francois Hollande fares even worse. Just 33% of his own people and 30% of the British and the Greeks say he is doing a good job. More than half the Spanish (57%) and the Germans (53%) think he is handling the economic crisis well. Yet German opinion of Hollande’s economic management is down 22 points from their assessment of the work of his predecessor, Nicolas Sarkozy. In general, European political leaders in 2013 are judged more harshly by their own people than the leaders who were in power in 2012. Former Italian Prime Minister Mario Monti, who was just leaving office the month the survey was conducted, experienced the greatest loss of trust. His poor showing in the March 2013 Italian election can, in part, be explained by the fact that just 25% of the public thought he was doing a good job handling the European economic crisis, a 23-point decline in support in just a year. France’s Hollande (33%), who had been in office only 10 months at the time of the survey, was also running 23 points behind the approval given Sarkozy in 2012, despite the fact that the French people chose Hollande over Sarkozy for the country’s presidency in May 2012. Spanish Prime Minister Mariano Rajoy, who remained in office, saw his support go from 45% in 2012 to 27%, an 18-point decline. And incumbent Cameron suffered a 14-point drop in British backing, from 51% to 37%. In Greece, Prime Minister Antonis Samaras had the support of only 22% of his population, down from the 32% backing given Lucas Papademos in 2012. When asked about attributes of their fellow Europeans, many national stereotypes are reinforced. People are most likely to see Germans as trustworthy, including 43% of the French who see the Germans in this light and 25% of the Spanish. The Italians (along with the Greeks) are seen as the least trustworthy by the Germans (18%). Additionally, Italians are named as the least trustworthy in Spain (17%) and in Italy (23%) itself. The French are characterized as the most arrogant by the British (30%) and the Germans (20%), as well as by the French (26%) themselves. Self-congratulation is common across Europe, while self-criticism is in short supply. The Greeks and the Germans each see themselves as the most trustworthy, the most compassionate and the least arrogant. In fact, people of every nationality consider themselves to be the most compassionate people in Europe. In addition, the British, the Spanish, and the Poles see themselves as the least arrogant. The French characterize themselves as both the most arrogant and the least arrogant. Notably, the Italians vote themselves as the least trustworthy people in Europe, but the most compassionate, which is exactly the opposite of the way they view the Germans.